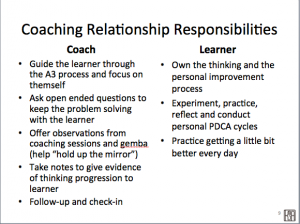 How should I start coaching using the personal A3 process? Many of you have reached out to me in the past two weeks since I published the first post in this series about using the personal improvement A3 process and wanted to know more about how to get started. 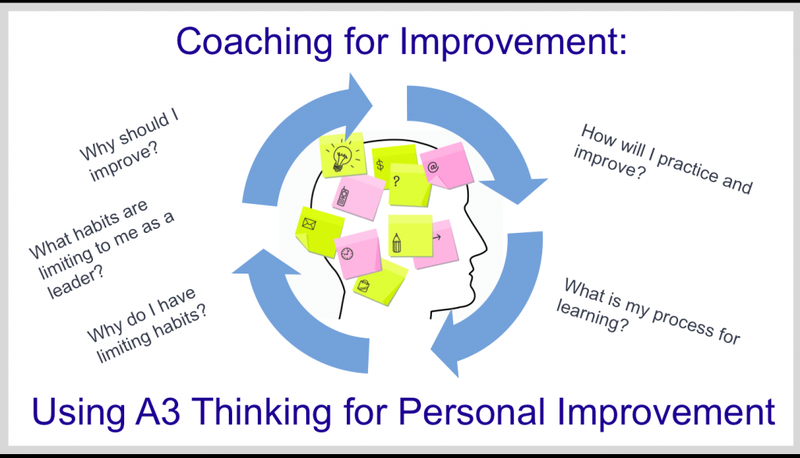 This post is for you and others who have similar questions about how to get started using the personal improvement A3 process as part of your coaching relationships. Click here to receive a free copy of A3 coaching guide that I created for the breakout session I led at the Lean Coaching Summit (also shared in the previous post)! Your learner has to want to be coached. He or she must also accept the hypothesis that “I am a condition that requires improvement”. This process is not one that will be effective for those individuals resistant to coaching. Contract with your learner on your role. As with any coaching relationship, you want to establish up front what your role is and what it is NOT. 3) guide the learner through the A3 thinking process. In addition to some of the tips shared in the coaching guide that you can get by clicking here, below are some expanded comments and thoughts I have shared personally with readers of this blog in the past two weeks. 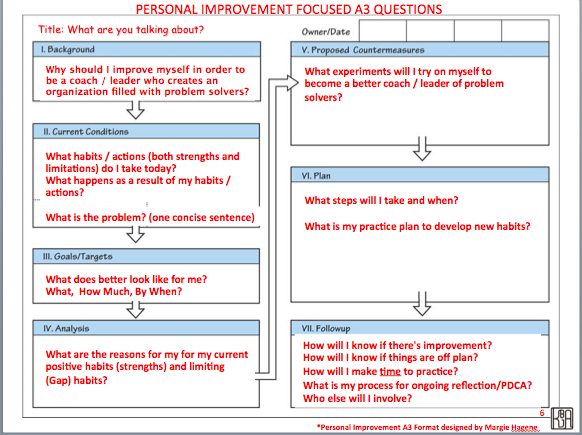 Remember that like any A3 thinking process, the development of the personal improvement A3 is iterative and requires “going to see” (go to “gemba”) to be able to provide observable feedback for the current condition. In this section, you want to help your learner set the stage for why they need to improve as a leader or coach in service to creating an organization filled with problem solvers. Why this? Why now? 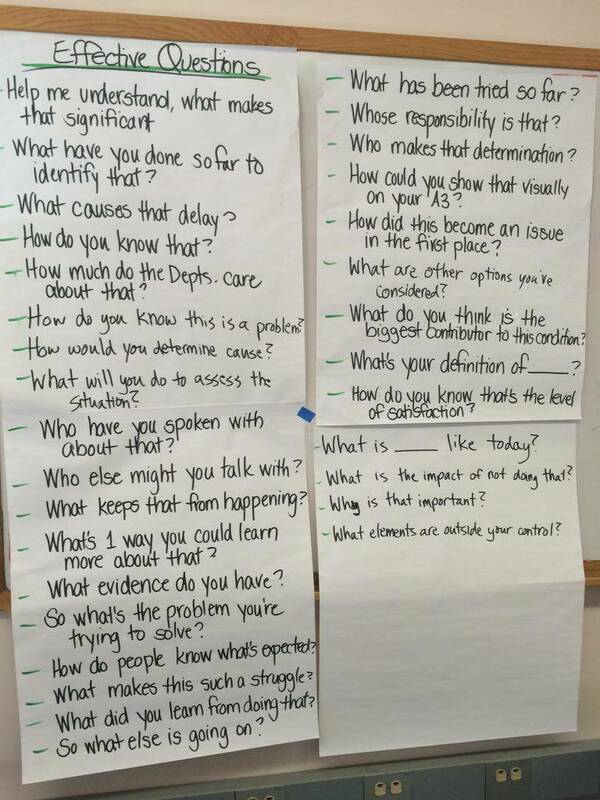 In this section, ask questions of inquiry to help the learner describe the current state of their actions as a lean leader. Keep your learner focused on observable facts. What habits and actions do they currently take? What are the observable outcomes of their actions? Focus on strengths and limitations. Go see to provide observable evidence! 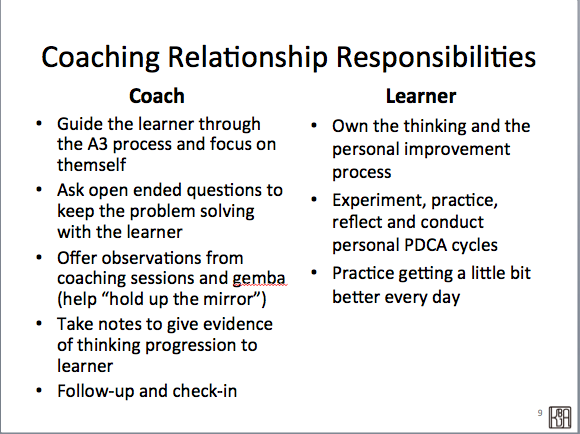 As a coach during this part of the process (assuming that you have had an opportunity to observe your learner in action before), you can help “hold up the mirror” to the current state by giving observable feedback so that your learner can understand their current condition. Keep your learner focused INWARD. One of the biggest “fatal flaws” I have seen when introducing the personal A3 is that some learners have a hard time focusing inward on themselves. 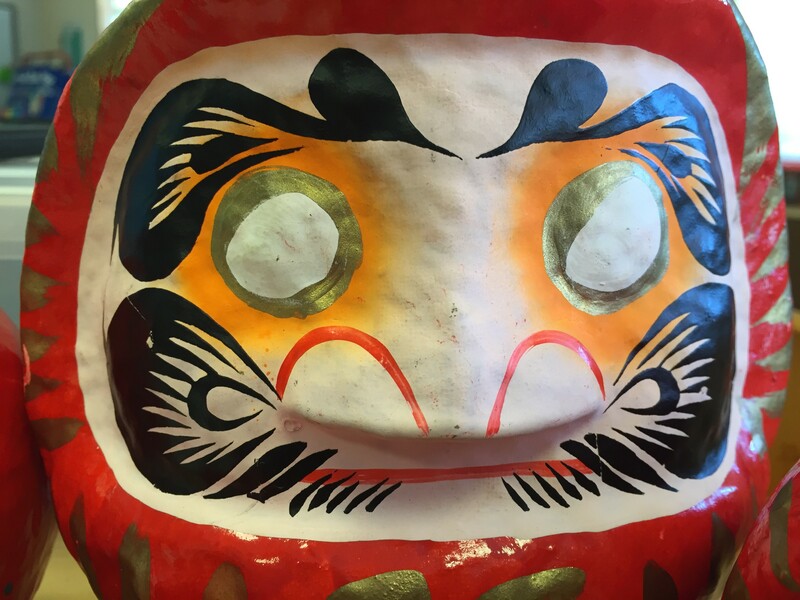 Instead, the A3 starts to be focused outward on problems they own, team dynamics, or something that might on the surface appear “personal”, but is really focused outward not inward. Help your learner choose one area to focus on. 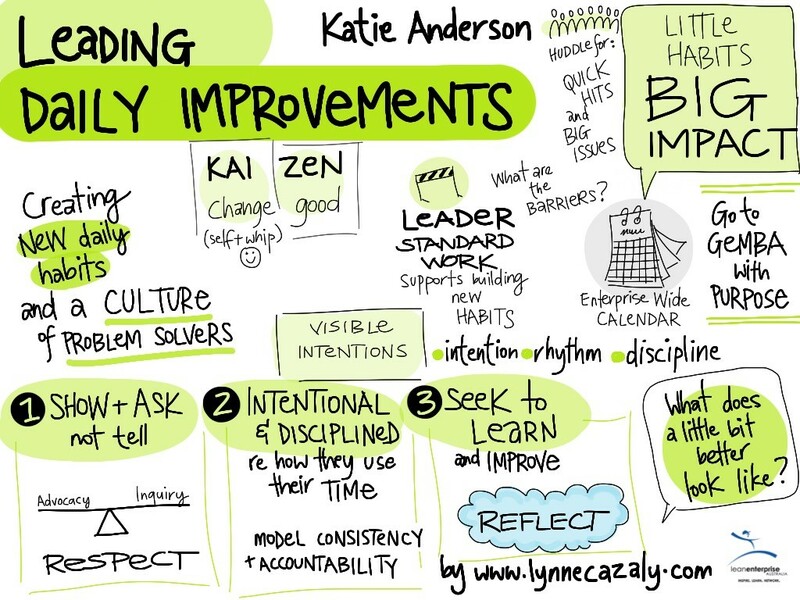 When trying to develop new habits, it is better to focus on one (or maybe two) small things to improve upon. Coach your learner to write one concise problem statement. Out of all of the habits described in the current condition, which one is the most limiting in their quest to become a better leader or coach? Remember, as the coach, you do not own the thinking. Your learner must own the decision on what their problem is and what gaps they want to close in their habits and actions. Targets and goals should be measurable and time bound. Measures can be simple, but the learner needs to be able to know how he or she is actually improving. Ask your learner “what does a little bit better look like?” It can be overwhelming to move to “perfect”, so start off with identifying the next target condition. What does moving towards better look like? Ask “why” to help your learner uncover the root cause of their limiting habits. The “5 Whys” (or two or six, whatever it takes to uncover the reason behind current behavior) is critical to uncovering the reasons behind your learner’s habits and actions. Only then can they develop appropriate experiments and countermeasures to overcome these habits and develop new ones. I welcome your questions and comments about this process in the comments section below. What have you learned by experimenting with this process? In a subsequent post, I’ll share in more detail how you can coach your learner through the “right side” of the A3 and support your learner in developing new habits. You can also get the coaching guide we created to support the personal A3 process by clicking here. If you enjoyed this post, sign up to be notified of new posts as they are published!